On Saturday, a rocket attack purportedly launched by Houthi rebels in Yemen struck a ship operated by the United Arab Emirates military, nearly sinking it. The U.S. Navy has now dispatched three warships to the southern coast of Yemen, raising the possibility that America could be drawn more deeply into the Yemeni civil war — and, by extension, the proxy war between Saudi Arabia and Iran. The UAE ship was “transferring medical aid to the city of Aden and evacuating wounded civilians for treatment,” according to a statement from the Saudi-led coalition. Reuters reports the Houthis claimed responsibility for the rocket attack and initially claimed to have destroyed the vessel, although the Saudi coalition said it was able to rescue passengers and salvage the ship. “The targeting of the civilian ship in an international channel has serious implications for freedom of navigation, and is an act of terror,” the UAE foreign ministry declared. “This incident demonstrates Houthi tactics of terrorist attacks against civilian international navigation in the Bab al-Mandab,” said the Saudi coalition, referring to the strait where the attack took place. Middle East Eye reports the coalition is describing Houthi insurgents as a “threat to shipping” in the strategically-located strait, which connects the Red Sea to the Gulf of Aden. 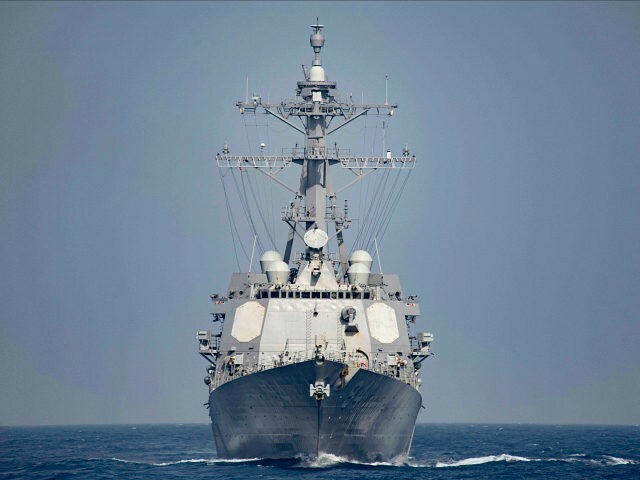 Fox News reported, and the Pentagon soon confirmed, that three U.S. warships — the guided missile destroyers USS Nitze and USS Mason, plus the afloat forward staging base USS Ponce — have been stationed off the coast of Yemen in the Bab al-Mandab strait. The USS Ponce, also known as the “Proud Lion,” is essentially a small aircraft carrier that can launch helicopters and VTOL aircraft, for missions including mine counter-measures and coastal patrols. A complement of special-operations forces is aboard, according to an official who spoke to Fox News. Nitze and Mason are armed with Tomahawk cruise missiles, Harpoon anti-ship missiles, and numerous deck-mounted guns. “Sending the warships to the area is a message that the primary goal of the Navy is to ensure that shipping continues unimpeded in the strait and the vicinity,” a U.S. official told Fox News. “While I can’t discuss our specifics of any response, we do have ships in the area and are working with allies and regional partners. We are committed to ensuring the free flow of commerce,” the official added. “We call on the Houthi-Saleh groups to immediately cease attacks against all vessels. These provocative actions risk exacerbating the current conflict and narrow the prospects for a peaceful settlement,” said State Department spokesman John Kirby on Sunday. Fox reports the weapons used against the UAE vessel were shoulder-fired missiles supplied to the Houthis by Iran — possibly Chinese-built C-802 anti-ship missiles or guided anti-tank weapons, in the estimation of USNI News.